While most slot games promise a fun time, Caishen's Treasure connects you directly with the Chinese god of prosperity and wealth. He came to earth to share his treasure and show his generosity. This is the story behind this 5-reel, 3-row slot which is styled with an oriental theme. 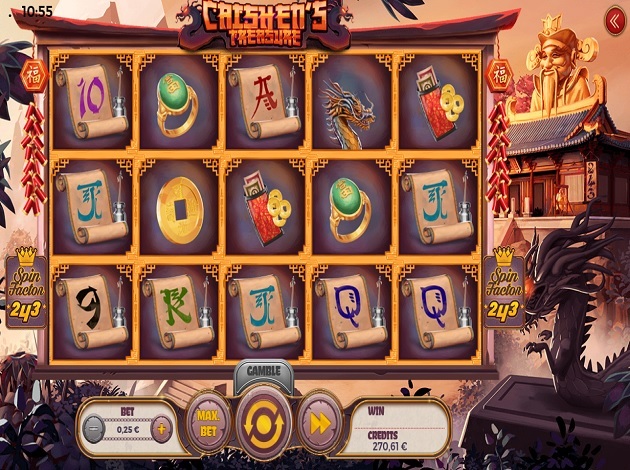 Caishen's Treasure features wild symbols, free spins and even a gamble feature. 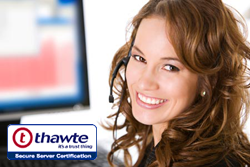 Offering 243 ways to win, the game does not have paylines. Instead, payouts occur when the same symbols land on adjacent reels. The game's free spins round is triggered when three or more scatter symbols land on the reels. You will be presented with five scrolls, each holding a different number of free spins and multipliers. During free spins, if you land a money bag symbol on both reels 1 and 5 you will receive a random multiplier of between 2x and 50x your wager. It is also possible to trigger a second free spins round during the first round. The gamble feature in Caishen's Treasure becomes available every time you register a win. You have two gamble options. For a 2x multiplier on your prize, you need to correctly guess the colour of the card. Similarly, for a 4x multiplier you need to correctly guess the card's suit. If you guess correctly you can guess again a further four times. With 243 ways to win, getting the right combination of symbols is a lot simpler. All you need to do to get a prize is land three or more of the same symbol onto adjacent reels. If you choose to, you can decrease the number of bet ways to either 81, 27, 9 or 3. All symbols in the game pay from left to right. The wild symbol, represented by Caishen, substitutes for any other symbol, except the scatter. With the wild symbol, it is, therefore, much easier to get a winning combination. Developed by Spinmatic, Caishen's Treasure is masterfully designed to depict a peaceful scene at a Chinese temple. The slot is offset to the left, leaving space for the majestic Caishen temple and dragon statue. The soundtrack compliments the theme beautifully, showcasing the distinct sounds of several oriental instruments. As you spin the reels you will quickly realise that they do not all spin in the same direction. In fact, whilst the odd reels spin one way, the even reels spin the other. Whilst this does not affect the result of the spin it can feel like a hypnotic experience for a few seconds. Caishen's Treasure has a good mix of bonus features and returns which makes it an ideal game for any slot player who is looking to have a good time. It offers very flexible wager options as well as the opportunity to instantly double or quadruple any prize.